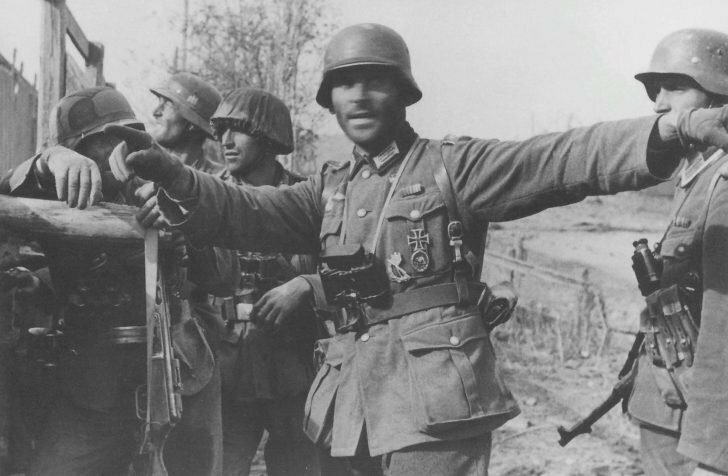 Hauptmann Friedrich Konrad Winkler (center) sets the combat mission for the soldiers of the 305th infantry division of the Wehrmacht in the area of ​​the Stalingrad factory “Barricades”. First left: commander of the 305th battalion of the 305th infantry division of the Wehrmacht (Pionier-Bataillon 305, 305.Infanterie-Division) Hauptmann Wilhelm Traub, (11/14/1895 – 01/05/1943), he is armed with Soviet PPSh-41 submachine gun . In February 1943, the Hauptmann (captain) Friedrich Winkler was captured and died shortly afterwards in a prisoner of war camp in Beketovka.